I did that on a machine we had, because of strict policies about updates. As I searched it seems that this package's installation is done through Windows Update (stupid) and I need to re-install Windows Update back so that I can install this package, and remove it again. But I can't find a solution on how to re-install Windows Update on Windows Server 2012. All I found is about WSUS, or about some other trouble that assumes that Windows Update is already working, or about DSIM which can't be found on my machine, etc. So, anyone can help me re-installing the Windows Update service, AKA wuauserv? You have to reinstall Windows Server. Since you deleted a system service, you can't trust this server anymore because nobody can tell you which system components/services are now broken. 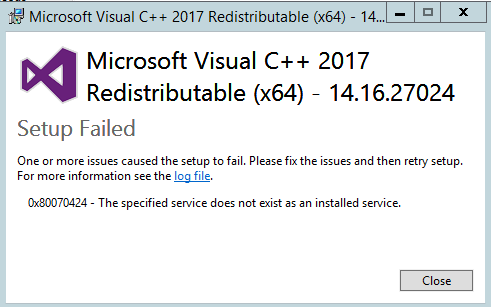 Computer configuration -> Administrative templates -> Windows Components -> Windows Update -> "Configure automatic updates" set it to "disabled". Not the answer you're looking for? Browse other questions tagged windows windows-server-2012-r2 windows-update or ask your own question. How to disable WSUS on our domain?